Now that nearly everyone on the planet believes in the gospel according to St. Al (Gore, of course) and agrees that civilization hangs in the balance because of global warming, it is time for me to confess to being a skeptic. Since we are in the midst of the most severe winter in half a century in many parts of the World and ice build up in Antarctica stands at one third more than normal, I think I have picked a good time to come out of the closet. In the spirit of full disclosure I must confess that I have always had difficulty in accepting anything out of the mouth of Veep Gore. Would you buy a used car from a guy who claimed to have invented the Internet? Or, was the inspiration for the movie “Love Story”? And, let’s not forget, he wanted to ban the internal combustion engine. Of course, St. Al is but a missionary in a movement that has swept the world, gaining momentum like a run-away truck on a steep slope. I have several problems with global warming that have prevented me from jumping on the bandwagon (or buying a Prius). First, it is an undeniable fact that in the distant past, much of North America, including northern Canada, was alternately a dismal tropical swamp and repeatedly covered with several hundred feet of ice. This alternate heating and cooling of the planet occurred over millions of years before the invention of the internal combustion engine or, for that matter, the discovery of fire. Secondly, I have seen in my lifetime (and so have you) dire predictions that have been spectacularly wrong. In April 1975, for example, scientists warned us that the next ice age was coming! You can look this up. “Newsweek” magazine did a feature story and scary cover warning us to get prepared-- the glaciers would be marching down the continent soon. I will remind you of some other famously wrong predictions later. But first, this might be a good time to stop and read Michael Crichton's speech to the Commonwealth Club called "Environmentalism as Religion". In one of the most perceptive pieces I have ever read Crichton explains that, in our increasingly urbanized and secular society, environmentalism has become a religion. He observes that, like religious beliefs, environmentalism relies on faith, often in the face of significant contrary evidence. He believes that the greatest challenge facing mankind is “distinguishing reality from fantasy, truth from propaganda”. He said think of today as the “disinformation age”. This is especially evident with today’s 24/7 news and the herd mentality of sloppy journalists. As an example, Mike points out the dire predictions of Professor Paul Ehrlich. In the 1980s Ehrlich predicted massive starvation from over population and that we would run out of critical resources including oil and gas. Wrong. Over the years he has made many such prognostications and all proved dead wrong. So, who would listen to this guy? Turns out, lots of people. He’s a respected spokesman for the environmental movement and often sought for his insight on TV shows. Over the years we have all witnessed countless examples of breathless warnings of this or that danger that turned out to be bogus. Remember the alar scare? And, what about butter? For years we were told not to eat butter but instead smear that goop, margarine, on our morning toast. Oops. Years later we are told that margarine contains “trans fats”, lethal to the heart and butter was the better choice all along. Transmission power lines cause cancer? (Or, was it erectile dysfunction? I forget.) Later, of course, we learned that power lines cause poor radio reception and nothing else. The list goes on. If you really want to get into this subject you might want to read The Skeptical Environmentalist by Bjorn Lonborg, although I warn you, it’s heavy going. It is a massive tome and reads like a college text on statistics, economics and biology. Ol’ Bjorn is a college professor of statistics in Denmark. He was once a member of Greenpeace until he wrote a couple of articles complaining that the environmentalists were drawing incorrect conclusions and misrepresenting the results of various scientific studies. Greenpeace kicked him out of the club and the environmentalists treated him like a leper. So, he decided to write a book and in excruciating detail describes their errors. Lonborg’s take on global warming is that although the Earth may be going through a warming phase, it is far from clear what is causing it. He points out that scientists differ on whether increased concentrations of CO2 can be blamed. And, in any event, he shows that none of the draconian solutions put forward will have any significant effect. He goes into detail on the cost of these proposals and the comparative costs of dealing with the problem. He also enumerates the advantages of global warming. As importantly, he debunks the dire warnings of Al and his ilk by citing in detail the science disproving the alarmist positions. 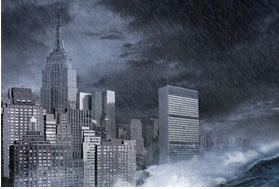 Sorry, New York City will not be destroyed in a tidal wave. Lonborg spends some time on the politics of the global warming movement and how the press deals with it. It should come as no surprise that the people behind this movement are the same folks who believe government should run everything. In my four years at Cornell I studied just about every science course offered. None of that makes me an expert on climatology, of course. But, it does give me some basis for critical thinking about science and reminds me of one important tenant…. “You can’t draw a trend line through a single data point”. Let me ‘splain. If you create a graph with the history of the Earth on the horizontal axis (time) and temperature on the vertical and you plot the temperature readings of the last hundred years on that graph, you have essentially a single dot. In other words, the sample everyone is considering is so small compared to the history of the Earth that it represents a single data point. You can draw a trend line in any direction through a single data point! The problem now is that this global warming thing has gotten to be such an accepted fact that everyone has jumped on the bandwagon and no amount of contrary information will change anyone’s mind. As Crichton has pointed out, it has become a religion; a matter of faith. And, you can’t argue with anyone’s faith. The next glacier could be creeping down 4th Avenue in Seattle and some people would be out in front of it waving “Stop Global Warming” signs. Funny article. Short but sweet! Come on now, haven't you heard about the heatwave the folks back in the northeast have experienced this past winter? Great article Cuz and well written. Did anyone forward it on to St. Gore? Speaking of the Saint I haven't heard or seen much of him lately. Maybe he got so cold (caused by global warming) he crawled into a hole, hopefully he pulled it in behind him.